Its All About Sn@p! All Week Long! Sn@p has taken the scrapbooking world by storm! Our super bright and happy collection is the the answer for capturing your colorful memories and everyday life in a Sn@p! Join us all week long for some happy Sn@ppy! inspiration! I have made many mini albums over the last few years, but never one that focused on my husband and I. Recently, we had new pictures of us taken and when I received my Sn@p Collection...I knew it would be perfect for an album about my husband and I.
I had a lot of photos to put in this album, so I used a lot of the Sn@p Pocket Pages. The cute frame and wood embellishments in the album are by Adornit and I love how thy added that extra special touch to the Sn@p Collection. I loved using the 3x4 Sn@p Cards. Not only were they perfect for the 3x4 pocket pages, but worked really well to help embellish a 6x8 page. I did a lot of embellishing in this album because that is one of my favorite things to do. I ended up embellishing inside the page pockets as well as adding embellishments outside the pockets. The 3x4 Sn@p Pockets worked well to store journaling. Sam, my hubby, one day wrote some cute things about what he liked about me and surprised me with it. I wanted to include these things in the album and this is how I did it. I also wrote down the things I liked about him. This one was of the funnest albums that I have put together. 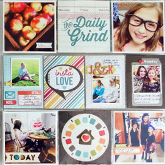 What is so wonderful about Sn@p is that you can use it to make any type of album or scrapbook page. My album is chuck full of Sn@p goodies and I would love for you to see the whole album, so hop on over to my Blog to see the whole thing. I hope you have been inspired today and join in with us and get Sn@ppin'! For my mini-album I chose to highlight the new addition to our family, our new puppy Nelli. This little furbaby has changed our lives for the better, and I wanted to highlight her first year in the album. I am following the same style as I use for Project Life, so on the inside cover I included a pocket where I can put the photos as I take them for inclusion in the album. For the inside pages I used a combination of pocket protectors in all sizes and album pages. The wonderful thing about this album was a) I didn't have to think about anything "matching" because it all coordinates so well, and b) I was able to put it all together in record time. Here are just a few of the inside pages. To see the more pages feel free to visit my blog! Just like the title of my album says, I love life and I love all those in it. I have been wanting to find a system to document my family's life in a simple, doable way while still feeling creative about how I did it. Sn@p Life came just in time and I am loving it! My album today is all about my little girl in her 2nd year of life beginning with her birthday. There are so many things I love about this system beginning with the size. The 6x8" size is absolutely perfect not to mention how completely adorable the album itself is. It doesn't take much effort to dress it up and make it your own...just a few simple supplies and favorite things from Sn@p.
Another favorite feature of mine are the pockets! I'm a big fan of bulk, dimension, involving the sense of touch, and inviting interaction. The memorabilia pockets and page protector pockets are a perfect way to invite interaction and provide places to store special trinkets, ephemera, extra photos, special letters, etc. I love layering over the page protectors to bring in more of that desire to touch and to bring in different layers. I've only just started down this new path of memory keeping but am so excited to have done so. I can't express the feelings that have come my way as I've taken time to start documenting my life and those special individuals in it. Not so overwhelming anymore! Stop by my blog: http://lilybeanpaperie.typepad.com for more photos and to see my Sn@p space...a way for me to keep the creative process flowing by keeping my Sn@p supplies out and ready to access whenever I have a minute to work on my binder. Kellie created a Sn@p album to highlight her son’s elementary school years. Kellie states "What I found great about using the Snap album for this was I have always had so many school photos laying around but I have never done anything with them" and the Sn@p album was perfect for my project! The really large photos like the 8 x 10 ‘s cut down really nicely to fit into the 6 x 8 page protectors, and the label stickers make it even easier to scrap these. I have so much of my son’s art work in boxes, I took some of his art from each year in school, cut it down and slid it into a 6 x 8 page protector, and of course added a label sticker! Snap is so much fun! It is so easy to work with and makes the process go so quickly. Check out more details on my blog at www.kelliesdesigns.blogspot.com! I have to admit that normally it takes me quite some time to put together a mini album. But when I decided that I wanted to create a mini about our family's 1st trip to Disneyland using the new Sn@p collection ... well, it just came together so quickly! I used the 6x8 Teal Binder, the pages that are included inside that, and the Sn@p Pages (Color Fushion - #4015 & So Random #4017)) for the pages inside my album. I loved using the 3x4 Sn@p Cards (Snappy Days #4008), (Snappy Thoughts #4007), (Snappy Sayings #4006) because these were such a great size to add onto the chipboard dividers and overtop of some of the 4x6 Sn@p Cards (Snappy Days #4011), (Snappy Thoughts #4010). I also liked the smaller scaled version (from the 6x6 pads) to cut out some of the bubble words, phrases, bingo cards, etc. I love adding dimension using pop dots when adhering the Sn@p Stickers (Icons - #4018) and the finishing touches on many of my pages I used the Sn@p Labels (4019) and Letters (#4020). I was almost giddy when I saw the fabulous collection of Sn@p Pockets (#4012, 4013 and 4014). I used a few of these throughout my album to hold the letter my folks gave to my children at Christmas and for our airline tickets. I'll use some more to store other things like the Disneyland maps and other fun memorabilia. I've shared more pictures on my blog so please feel free to stop by and see more of my album. This is still a work in progress but I am already looking forward to sharing it with my family when it is done! Thanks for taking a peek at my album today! Recently I joined Instagram and decided to print all my favorite Instagram photos in a 2”x2” size. Then I wondered what in the world I was going to do with all these little Instaram photos. Enter SN@P! A SN@P album dedicated to Instagram pictures was the perfect way to save all these little photos AND document so many everyday moments. All the SN@P products are perfect for journaling everyday memories and organizing everyday photos. I used a page to mark each month. Each monthly page also has a pocket to house extra photos or small bits of memorabilia from that month. Within each month I can use a variety of page protectors and pages and different journaling cards depending on how many photos I have from each event. I am so excited to finally have a place to keep all my Instagram photos and a way to preserve all the everyday moments I capture with them! Come check out my blog for more photos and close ups!" It's All About SN@P! - All week long! When creating my pages I added photos and elements to the page protectors, placing stickers and journaling strips on top of the page protectors. I love the variety this provides. Each page is unique but still coordinates with the entire book. I would love for you to come on over to my blog and check out the rest of my album! These little binders make it so easy to stay organized. I’ve actually gotten comments at the grocery story about how nice my system is for holding my coupons, not to mention the custom design with the Sn@p collection. I recommend using some packing tape or contact paper to seal the design of the cover so that the paper and embellishments stay in their pristine condition with all of the use your album will get. I had a great time combining the Sn@p alphabets with this 3 x 4 Sn@p card to make my sassy title. Please visit my blog, My Little Sketch Blook, for details on how to start saving today! Who all had a garden this year? I'm pretty sure for the most part, you all are done picking from your garden, correct? This week, I was able to pick fresh jalepeno peppers and tomatoes striaght from my garden. For living in Ohio towards the end of October, that's odd. I decided to make the best of it! I was able to can 10 jars of salsa this week! Gotta love homegrown goods! We have a party to go to this weekend for my mother in-law's birthday, so I wanted to take a little something to munch on. Salsa sounded good since I have an abundant amount... but I wanted to dress it up a little before I give it away! I used Harvest Lane because this collection seemed like the best choice for this time of year. Plus, I am really drawn to the beautiful colors. I cut out a few scalloped circles to attach to the lids. Since i didn't have any fabric on hand, I decided to give it a try with paper. I tied a couple f bows and attached some tags and now these jars of salsa are ready to go to the party! Speaking of sliced bread, have you seen the SN@P! albums? They're the greatest thing since sliced bread - ha ha, how's that for a smooth segue?! But seriously, they're such an amazing mix of product and goodness, all included in one great little album. Today I wanted to share with you a project I designed and taught at an event earlier this fall using a SN@P! album. I'm a firm believer that we all have many things to be thankful for, and we should document what those things are. So that's just what I did! I started with the Documented 6x8 Mix and Match Album and added stickers and papers from the Noteworthy line. While I LOVE the richness, patterns and colors of Noteworthy, I wanted the album to have pops of color to lighten things up a bit, so I added several different papers from the Fabulous line. On this next page, I left two spots of the divided page protector empty; the fun thing about doing this is that because the page protectors are clear, you get a peak of the next page to come! The SN@P! Albums give you the option of keeping things really basic in order to get a project/album done quickly or to really customize things, mixing and matching different products from different lines to truly make something unique and your own. I had so much fun using a SN@P! Album for this project that I've already picked another one to use for my December Daily album this year. Watch for a post from me again in December with pictures to see what I did! That is exactly what this collection makes me...sn@p happy! It is one of those collection that is full of color, and life, and downright happiness! This layout was made using mostly Sn@p Life Basics Kit and 6x6 pad. I used my Cameo to cut the names and first part of the title out of the different colors of paper. The pink letters are from the Sn@p Stickers Letters set...have you seen these yet? You get a sheet of every color in the package and the letter size is perfect! I also made a card using this collection. Love how quickly and easily this all came together! Project Life In a Sn@p! Whew! What a busy year this has turned out to be! I was so excited to do Project Life (the concept begun by Becky Higgins) for 2012, but I chose not to purchase any "kits" as I figured I could just whip it together myself. True, that worked pretty well having a great line on Simple Stories products. But by spring I had fallen way behind, and in the summer I had to pack all my supplies up for a move. So, when I found myself with some (albeit limited) time and creative energy last week, I decided to try to play a little catch up. I turned to my box of Sn@p thinking there just might be some great Project Life tidbits in there... and boy was I right! Look at how versatile all these sets are! Next, I worked on my two slots with photos. I love the neutrality of the 6x6 paper patterns but created with great, fun colors! In addition to the sticker icon pack, I also added some labels. Yup, all come in a single pack! Lastly, I worked on my sub-title slot and journaling. Pulling the letter stickers pack back out, I just added a sub-title to the pre-printed card and it was quick and easy. The 2x3 card packs are also sheer perfection. A little card plus a trimmed piece from the 6x6 pack and I had a perfect journaling spot. All together, this layout took me 40 minutes to sn@p together. Now I have hope that I might actually finish Project Life 2012 before the end of 2013 ;) . Seriously though, if you have fallen behind, just grab some Sn@p Studio and have fun. You'll be caught up in no time! I think I may have admitted to not being a project lifer before. But that doesnt mean I dont love SN@P! Even us traditional 12x12 scrappers can use everything from the SN@P collection. And I am so glad because it is one amazing collection! Especially if you love scrapping everyday moments. One thing I scrap over and over is the personality of my kids. Or how about the set of label stickers? Actually I dont think I could just pick one! I am just excited to see it all! Whether for Project Life or traditional scrapping--have you had a chance to play with SN@P yet? I've been in a scrapbooker for the last 9 years, and I have to be honest. There hasn't been a line I've been as excited about as Sn@p in a long time! The colors make me so happy, and the variety of stickers are PERFECT for Project Life. I am finishing my first year of PL, not having missed a week, and I LOVED using SNAP for the last few weeks! Here is my week of Sept. 24 through 30. This week came together quicker than any other week through the year! I also used Sn@p for the next week, Oct. 1 - 7. I am currently making a mini-album with the Core Collection, and I am LOVING IT! I see myself using this line for a very long time, not only for PL, but for layouts as well. If you do PL, this is a MUST HAVE line! I'm sure you have noticed how much fun the new Sn@p Collection is with all of its bright colors and playful sentiments. I think it is my favorite Simple Stories collectio to date... The colors seem to compliment just about any photo you can come up with, so I thought I would use the collection for a Fall portrait page of my daughter. I could have easily used the Harvest Lane collection, but had to try some Sn@p.
I really like the idea of a journal pocket, so I used one of the kraft colored pockets from the Sn@p Pockets - Color Fusion Assortment. It worked perfectly with the numbered journal elements from the 3 x 4 Sn@p Cards. I simply cut the numbered journal strips apart, wrote my sentiments and stuck them in the journal pocket which is attached to the layout with foam tape. I also love the cardstock stickers with this collection, especially the month and days of the week sentiments. It was easy to combine them for the title of my layout. Hope that you had a wonderful and crafty weekend.